In 1889, a group of Hawaiians moved from the Wasatch Front to Skull Valley in Utah's West Desert. They called the place Iosepa. The public is invited to visit the site on Saturday, July 17, for Public Archaeology Day. The students from State University of New York at Potsdam have uncovered what looks to be an old foundation and artifacts, including a piece of jewelry made of a sea shell. Assistant Professor of Anthropology Benjamin Pykles said, "That reminds us why we're here and it reminds us these were real people here -- actual Hawaiians, Pacific Islanders, and they've come all this way, here in the middle of this desert, and they're making a living for themselves." 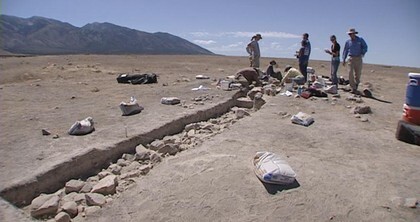 LOCATION: The Iosepa dig site is located off Interstate 80 in Tooele County. Drivers take Exit 77, then go south on State Road 196. Thank you, KSL, for this info! Click Here to read more about the dig site and what they have found so far.